Prime minister Mark Rutte entered the debating arena for the first time in the election campaign as eight party leaders went head-to-head in Amsterdam’s Carré Theatre. The second televised debate of the campaign on Sunday was a more heated encounter than last week’s five-way leaders’ debate, but none of the challengers to Rutte landed a decisive blow. The format of the evening, with four mini-debates between four leaders, drawn by lots, meant Rutte avoided a direct clash with his closest rival, Christian Democrat leader Sybrand Buma. Buma, who has been encroaching on Rutte’s VVD party in the polls, sought to promote himself as a more trustworthy, conservative alternative. In the opening debate on health he reminded viewers of the prime minister’s promise in 2012 not to pay another cent towards Greece’s debts. Buma was also the leader who identified most closely with supporters of Geert Wilders’s PVV party. In a debate on Dutch identity he said the Muslim community should be challenged to speak out against extremism and called for a ‘radically different’ approach to immigration. He finished by praising the Wilhelmus as the ‘oldest and most beautiful national anthem in the world’. Rutte repeatedly referred to his experience of his six and a half years in office, attempting to place himself above party politics. ‘As prime minister it’s my job to make this country stronger, more prosperous and more stable,’ he said during the debate on the EU. Rutte also stressed fiscal responsibility, dismissing both Krol’s plan to restore the retirement age of 65 and the demands from several parties on the left to abolish the excess charge (eigen risico) in health insurance as unreasonable burdens on taxpayers. Krol emerged from a difficult week in the media in fighting form, making his biggest impact when he took his turn on the stand to face questions from RTL’s inquisitor Diana Matroos. Krol turned Matroos’s question about whether he had ruled himself out of a coalition against her by accusing her of narrowing voters’ choices. Matroos opened the evening with a fierce grilling of Labour leader Lodewijk Asscher, but after Krol’s intervention she took a less aggressive approach, putting just two questions to Rutte, the final interviewee. On the left, GreenLeft leader Jesse Klaver was the most confrontational, accusing Buma of not standing up for ethnic minorities who had felt marginalised since the turn of the century and rebuking Rutte for stalling pensioners’ incomes over the last four years. In turn, Klaver came under fire for his plan to raise taxes sharply in order to speed up the switch to renewable energy. Socialist leader Emile Roemer went on the offensive on the cost of healthcare, denouncing the excess charge as a ‘crude penalty on the sick’, and the effect of later retirement on youth unemployment. ‘As long as 150,000 young people are looking for work, the retirement age should go back down to 65,’ he said. Labour’s Lodewijk Asscher had another quiet evening, preferring sober analysis of the facts to a direct attack on his rivals, in contrast to the general tone. The gamble PvdA members took in replacing Diederik Samsom, the standout performer in the 2012 debates, with Asscher has so far not paid off. Marianne Thieme, leader of the animal rights party PvdD, tried to stand out as the only leader not to seek a role in the next coalition, preferring to champion the merits of idealism. ‘Compromise seems to have become an aim in politics rather than a means,’ she said. D66 leader Alexander Pechtold looked to build on his performance a week earlier as the leader willing to seek consensus with all sides and promote a positive message. In the debate on national identity he stressed the historic Dutch values of ‘tolerance, forbearance and freedom’, while in the debate on the EU he called for Europe’s nations to work together more closely, in contrast to Rutte who said Europe should only be involved where it was necessary. Notably, the leaders largely avoided mentioning the man who stayed away from the evening, PVV leader Geert Wilders. One of the few references came from Pechtold, who said parties should try to identify why voters are drawn to the PVV rather than simply echo Wilders’s rhetoric. ‘These people aren’t all white, angry and over 50,’ he said. 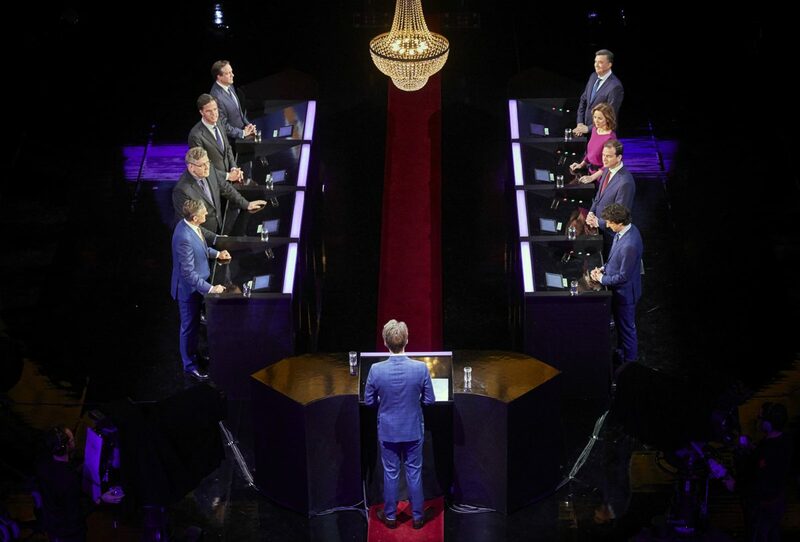 In a viewers’ poll carried out by RTL straight after the debate, 17.4% of viewers chose Klaver as the overall winner, followed by Pechtold on 16.7% and Rutte on 16.6%.